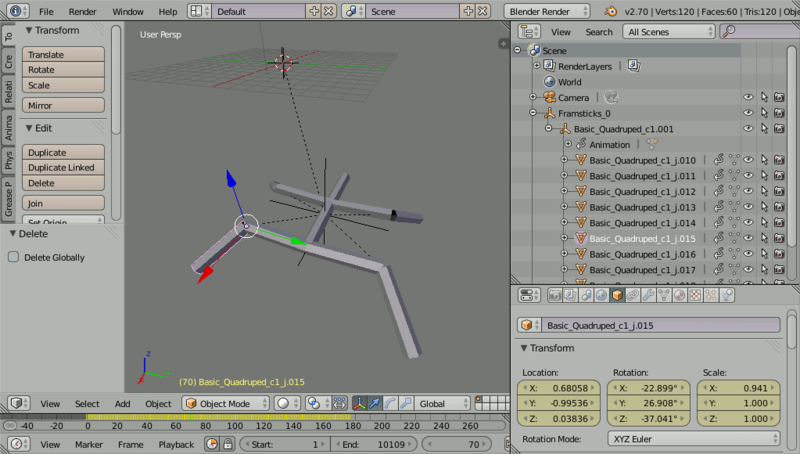 Blender can be used to preview the POV-Ray animation before rendering it in POV-Ray. And not just preview! You can use Blender animation tools to make the camera precisely follow your intended path (matching imported Framsticks creatures) and then store Blender camera movement back into the original POV-Ray files, so POV-Ray renderings will follow Blender's camera movement! You might want to use Framsticks creatures as a part of some Blender animation project. This application is currently limited by the extremely basic look of the imported creatures, but you can always model the imported creature elements in Blender according to your needs, preserving the original animation that was based on Framsticks simulation. This script is a rewrite and an extension of the earlier work by jm soler. We tested it in Blender 2.70a only. Download frams-pov-import.py from our svn or trac. Click "Install from file" and select the previously downloaded frams-pov-import.py, then click the checkbox to enable "Framsticks POV import & camera manipulator". 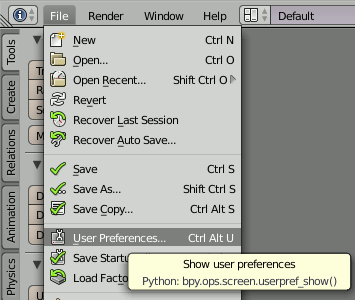 Click "Save User Settings" if you want to keep it enabled permanently (otherwise it will be disabled the next time Blender is launched). The imported animation will start with the current frame, make sure the correct frame is selected in your timeline view. Select File / Import / Framsticks POV. 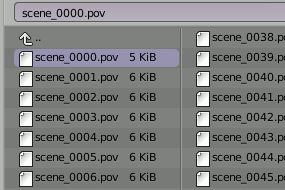 Importing will load the entire sequence of POV files starting from the indicated file. In most cases you want to choose scene_0000.pov. Selecting frame step bigger than 1 will skip every n-th frame, which will save processing time and memory usage, but will result in a coarse animation. This is usually not acceptable if the animation is meant to be rendered by Blender. However, it may be useful if Blender is only used as a preview for POV-Ray rendering, especially when the scenes are very complex. Framsticks creatures are built from simple cylinders, ignoring all special properties, receptors and effectors. For convenience, creature elements are placed under the corresponding creature object in hierarchy, and all creature objects coming from the single import belong to the same Framsticks object. 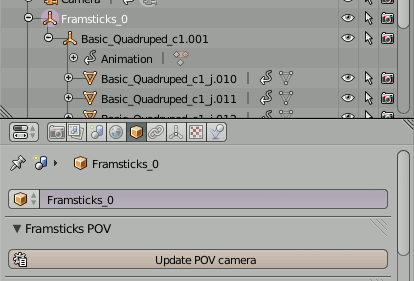 Blender camera movement can be transferred to (stored into) POV-Ray *.pov files using the "Update POV camera" button in object properties of the Framsticks object. 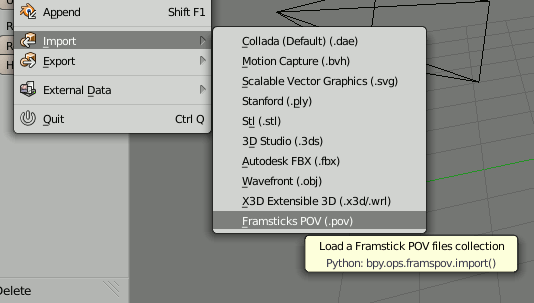 Importing Framsticks/POV-Ray camera from *.pov files back into Blender is not implemented. If you expect you will need the camera movement to be modified some time later, make sure to save the Blender *.blend file. This file will contain the animation and the link to the original *.pov files.